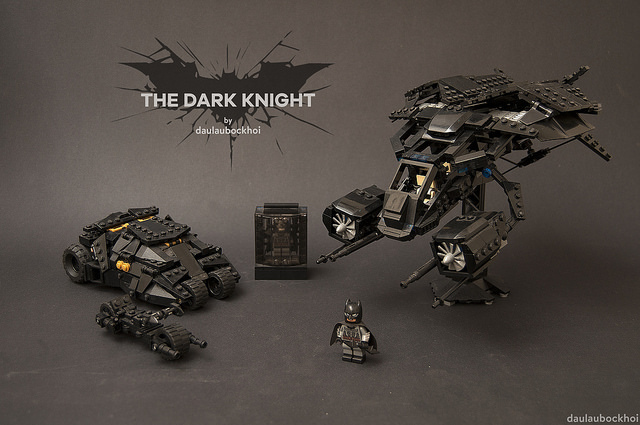 Designer BenFifteenTheChicken puts together the playset that every Batman fan not only needs but deserves. 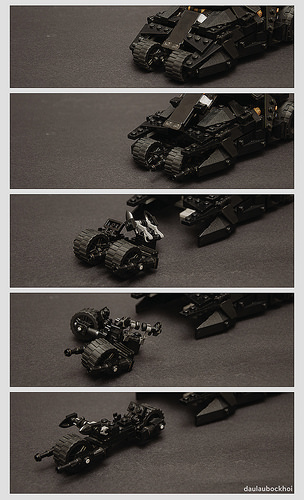 At first glance, the setting of this LEGO creation looks similar to the 76001 The Bat vs. Bane™: Tumbler Chase, but the huge difference is not just that the models have the right bat-colored theme, but also that the builder has upgraded and redesigned each vehicle so that they have the proper look of the machines featured on the big screen. My favourite bit is actually the miniature Bat-Pod built with minimal elements, but with maximum impact — with a secret feature! It actually is part of the Tumbler, secretly hidden and tucked within the front wheel layout! As I’m finally able to start putting my sets on shelves I was remarking on how many Bat-Vehicles I have, and wish they would make some vehicles for other heroes too. However, if they made this? I’d be all over it like sweet on sugar.